THE HAGUE - Member of the Second Chamber of the Dutch Parliament Ronald van Raak of the Socialist Party (SP) will stay on as his party’s spokesperson for Kingdom Relations. “I am not letting the islands down,” Van Raak said on Monday. Member of the Second Chamber of the Dutch Parliament Ronald van Raak of the Socialist Party (SP) will stay on as his party’s spokesperson for Kingdom Relations. “I am not letting the islands down,” Van Raak said on Monday. 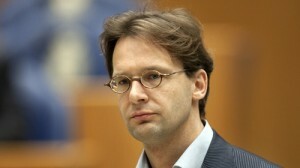 The Dutch Parliamentary elections last week Wednesday may have brought some changes to the Second Chamber’s Permanent Committee for Kingdom Relations with some prominent members like Jeroen Recourt and Roelof van Laar, both of the Labour Party PvdA leaving, but Van Raak will surely remain as his party has given him the green light to keep the portfolio. Van Raak, who is a veteran in the Kingdom Relations portfolio as he has been a member of the committee since 2006, isn’t too optimistic about the future of the Kingdom, especially not when considering the developments in Curaçao and St. Maarten. “I foresee a challenging and difficult time. The future of the Kingdom is at stake,” he told The Daily Herald. There is resistance from the islands when the Kingdom, which is responsible for good governance, intervenes. At the same time there are people who want the Netherlands to intervene, people who share their concerns with the MPs via emails and other means of communication, said Van Raak. “The large-scale investigation into the ties between the underworld and the upper world in Curaçao and St. Maarten, requested by the SP and the liberal democratic VVD party, is yielding results,” said the MP.